Called 'mosaic patchwork', English quiltmakers had been working with the hexagon since the mid-19th century. 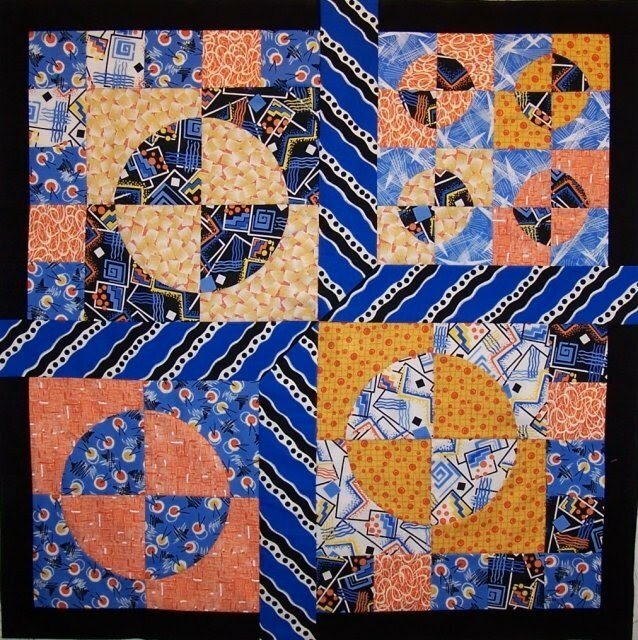 Perhaps inspired by beautiful marquetry boxes and tiles from the Middle East, English quilters cut hexagonal shapes from paper, basted a fragment of fabric over the hexagon and when enough patches were made, whip-stitched the patches together from the front of the work in rings of six patches around a center hexagon. The comparison to a flower--petals around a center- was inevitable. In the 1920s the hexagon patch, long the favorite quilt pattern in Great Britain, steadily worked its way onto the American quilt scene. The attraction to the six-sided shape is easy to understand. The hexagon patch was small, portable, and easy to arrange in rings ('rosettes' to the Brits) and seemed a graceful thrifty way to use all those sweet novelty prints just coming onto the market. But American quilters, used to working scrap-style with tiny pieces of fabric, dispensed with the English paper under-patches and simple sewed hexagons together with a running stitch as usual. Someone here labelled the hexagon pattern Grandmother's Flower Garden, a tribute title of an earlier time. All things Colonial American were hugely popular in the 1920s. You might, in reading history of the time, think of the phrase 'Roaring 20s' but truthfully, most Americans, outside of large cities, thought that bathtub gin, flappers, and jazz were a passing fancy. Thousands more were picking themselves up from the flu pandemic, World War I, and trying hard to earn enough money to buy their own Model T Ford. It was business as usual and quilting was undergoing yet another rise in popularity. Once when at a flea market, I spied what I thought was an average Grandmother's Flower Garden quilt in the pile and pulled the quilt out to examine. However this was far more than a common 1930s GFG--it was a late19th century English-sewn mosaic quilt and now it lives with me. The last picture shows that the patches were whip-stitched together from the front plus the edges of the quilt were knife-edged. That means the layers folded in towards each and sewn together. 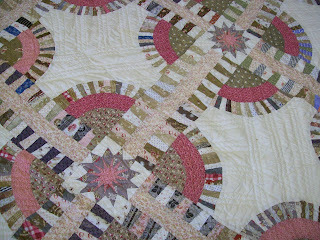 I have a friend in Oregon who collects wonderful old quilts and the pattern New York Beauty in particular. The block to the left is from one of his quilts. You can check out his website at www.billvolckening.com and see a video about Bill and his extraordinary collection at this link http://www.nwdocumentary.org/gallery/2061 . When I recommended an old NY Beauty ebay find to him, Bill and I shared our our mutual love of all things scrappy and pointy. Then I realized that way back on the shelf, I had a NY Beauty pattern quilt too but when it was sold to me, the dealer had called it Rocky Road to Texas. I had seen it literally tumble out of a garbage bag of quilts onto the show floor in Houston, Texas and jumped on it immediately--love at first sight. What was there about the slightly worn and very soft surface of this small scrap quilt that intrigued me? I think this quilt has heart. Not high-falutin' technique. tee-tiny stitches, or expensive fabrics. But heart and history. 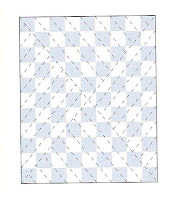 I can relate to the long-ago quiltmaker using every scrap as carefully as possible and imagine her showing off her skills as she carefully sewed the small compass blocks between the larger areas. This quilt is still a Texas Beauty. As a brunette with a slightly sallow complexion, all my life I've been told that yellow is not a color I should wear. Perhaps that's why as a quiltmaker, I am so very attracted to the sunny side of the color wheel and often use colors like yellow, gold, and orange in my quilts. There are marvelous precedents in nature sporting shades of orange and yellow, such as the trio of buddies here. 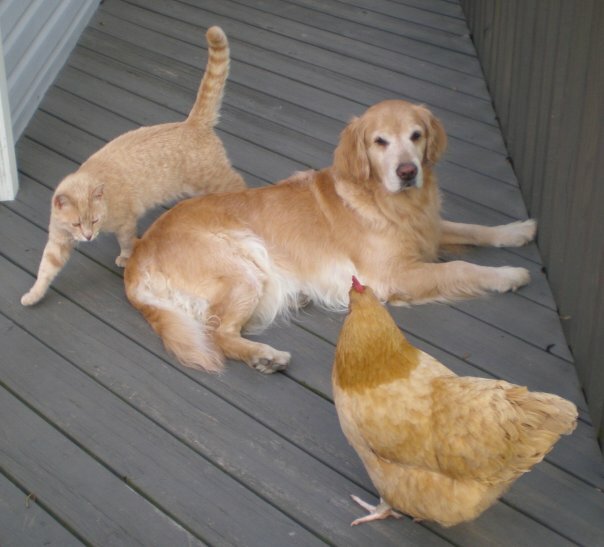 Rosie the retriever is in the middle and we'll call the other two Purr and Peck. They are the pets of Gail Kessler, designer extraordinaire for Andover Fabrics. When collecting antique quilts, I cannot resist orange, bright gold, or brilliant yellow--I am drawn to them like a bee to honey. 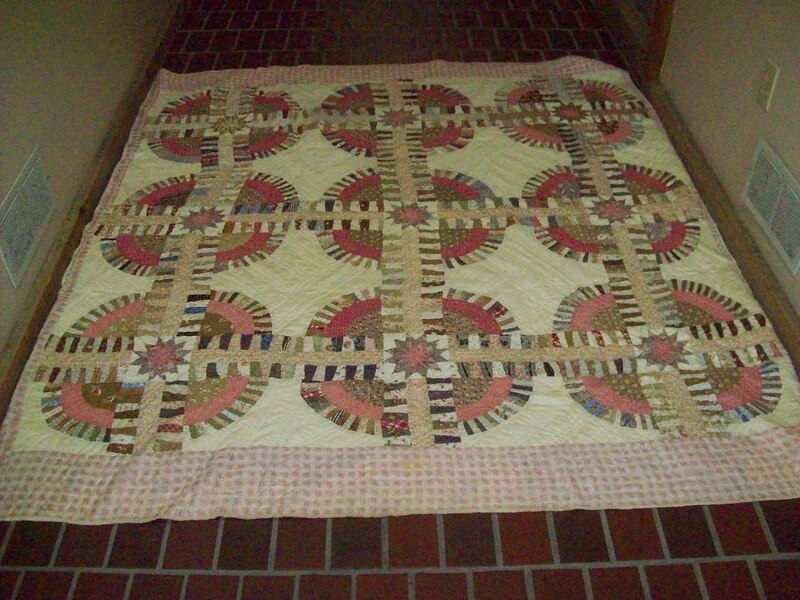 This unusual folky Compass quilt was found in Southport NC but was made in the Apex area, c.1900. Then there's a 1960s Baby Bunting quilt from Georgia. It's a hot shade of orange and the workmanship is the pits but I love it. 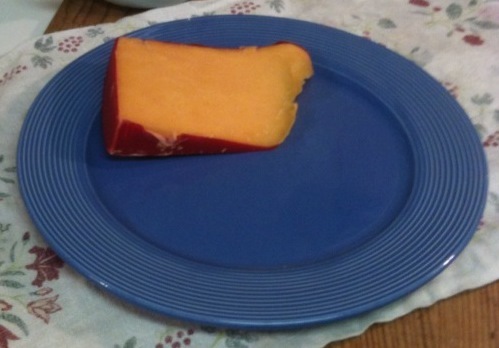 Or again this c.1920's take on the Maple Leaf pattern set with bright cheddar. 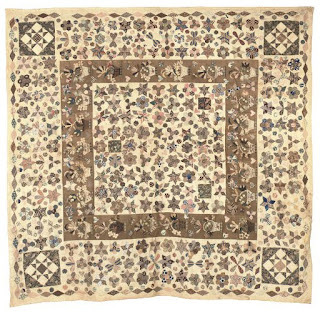 The emphasis in this blog has always been on antique quilts but sometimes parts of one's life intersect in odd ways. 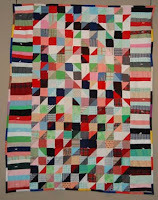 Recently I bought an old scrap quilt in an online auction and won it--way cheap as I won't spend much. When the quilt arrived it had that familiar tang (eau de dust) so I threw it in the dryer after misting heavily with some lavender water. When the quilt came out of the dryer, both Gipsy and Earl Grey, our 10-month old kittens, ran to inspect it. Earl was soon distracted (it was almost dinnertime-) but Gipsy persisted in her examination. 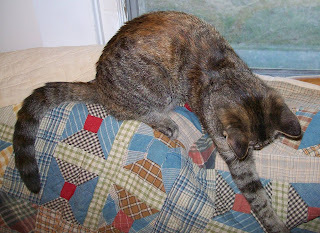 I think Gipsy especially liked the quilt because its muted colors mimicked her own fur. She sat on it all day. That got me thinking about the origins of the quilt. I got very little from the seller. He could tell me that he obtained it at an estate auction in Texas and correctly placed its age as c.1900-1930. The pattern is Bow Tie. Sometimes a Bow Tie quilt was made for a man or perhaps simply an appropriate pattern for a quiltmaker's available selection of non-floral fabrics. The materials of this scrap quilt look like work shirt checks, striped tickings, and a few polka dots for fun. The mellow color scheme appealed to me, just as it did to Gipsy--who is a bit of a 'scrap cat' herself. Although her Mom was mostly Siamese, Gipsy's dad must have been a tiger tabby. Here is Mama, back in early June 2009, a-swarm with seven kittens. Gipsy is determinately scaling Mom's hip, her small tail looking like a brush. Mama cat, later adopted and named Snowball, looks a tad shell-shocked. That must have been a wild night! I've wondered if the propensity to arrange tiny pieces of fabric in different patterns might not be some sort of genetic marker. Some natural tendency passed down through generations whereby those afflicted try to make sense of the world by controlling, albeit in a minor manner, the creative chaos. Highfalutin' phrases for this simple question: is quilting genetic? In my family, I thought I'd not gotten any quilting genes but then again, I possess two very ragged family quilts. Both from my grandparents' generation (1920s-30s), the first is a ragged kid's quilt made from Ruby McKim's Birds pattern. 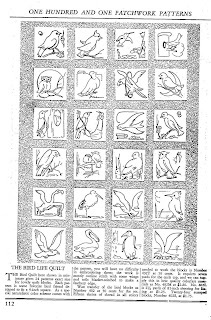 The pattern, scanned from the 1931 McKim Studio catalog, is shown at right. My dad, who had worked on the quilt as a kid, proudly gave it to me when he realized I probably was going to be a quilter forever. The other is, at first glance, a totally white quilt. 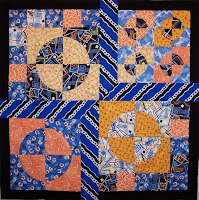 Odd, since there are appliqued blocks which if viewed in a strong light, show as a typical Rose of Sharon quilt. And that's what strong dry-cleaning fluid will do to old quilts! Mom told me that quilt was made either for or by her mother. But that's it--the extent of the family patchwork legacy--two very faded quilts. 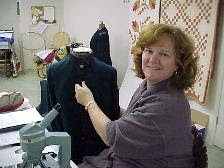 Some lucky people come by their quilting talent in their family and you can trace their heritage. 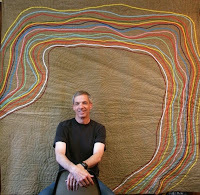 Joe Cunningham out in San Francisco is one such gifted quilter. His website is www.joethequilter.com . Joe's own work ranges from the traditional to the contemporary and recently he sold his handmade quilt Bend in the River to the deYoung Museum. That's why he's grinning in the photograph! There's an exhibition at the AQS Quilt Museum in Paducah KY that also displays Joe's work plus quilts made by his mother and grandmother. These are wonderful and I am envious that Joe can truthfully say he comes by his quilting genes naturally.The Dresden Plate quilt is by his grandmother Minnie Rose. Joe's mom Janice made this indestructible, bright-as-the-day-it-was-made polyester double-knit beauty. 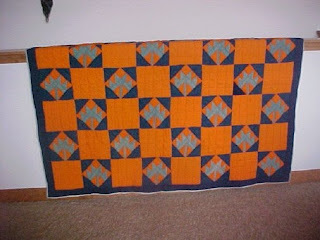 Thank you to Joe for letting me write about him and his family quilts. So, go rifle through the quilts in that old trunk and see what your own quilting DNA might be! This last Friday and Saturday in the spacious barn-like wing of the Core Sound Waterfowl & Heritage Museum on Harkers Island, North Carolina, the atmosphere was somewhere between a bustling rug bazaar and a surprise birthday party. Before 10 AM, people started parading in bearing stacks of old quilts or wheeling in suitcases of their treasures. They plopped down in front of the registration table and the stories started reeling out. "This quilt was pieced by my great granddad's sister and she had seven children..." The registrants did yeoman duty as they carefully listened and noted all the family information about the quilts and gave each piece a number. This went on for two whole days. The second stop was at the photographer's tables where the quilt got a pinned-on sleeve and was hoisted against a white wall for its "portrait shots": an allover picture, a detail, and then the back pinned up in a triangle across the quilt. Then the quilts came to Lynn Gorges' and my tables where we measured the quilt, looked up its pattern name in a Brackman reference book, speculated on age and considered the quilt's condition. 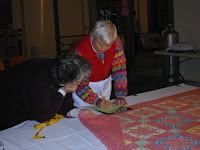 Each evaluation table had at least four helpers: an evaluator, a scribe and two people who worked as a pair examining the quilt and calling out measurements. If the quilt owners had interesting stories, we urged them to 'sit a spell' and give an oral history for the Museum. We even rescued two quilts from the back of a pick-up going to the dump--worn-true-but usable by the Museum staff as exhibit backdrops. Most of the quilts we saw were pieced quilts with only a rare Dresden Plate, applique, or crazy quilt. 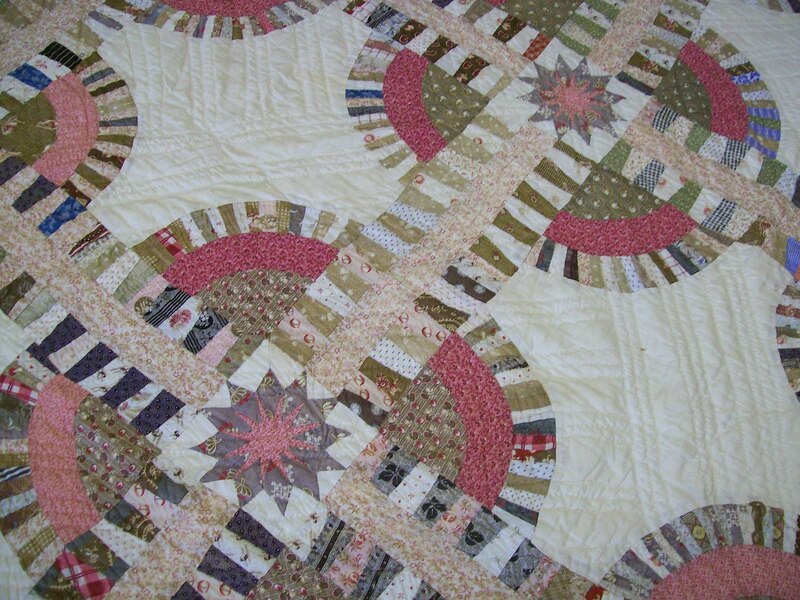 Many were string-pieced or a Log Cabin variation, a favorite pattern in these parts. One lovely faded partially patchwork, partially crazy-pieced quilt had all the bells and whistles: use of common dress goods and home-spuns, hand pieced and quilted, a creative combination of patterned blocks and scrap techniques, and marked in a Core Banks Cross, an allover X-type quilting style seemingly indigenous to Downeast North Carolina. Can you see the X? The design was marked with a taut chalked string plucked at diagonal corners when the top was first put into the frame and then each quadrant of the X got parallel diagonal lines marked with the aid of a piece of lath. 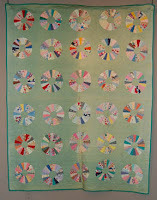 Ladies told me it didn't matter what pattern your quilt was-Flower Garden, Nine Patch, Log Cabin. If the quilting groups at Stacy or Atlantic quilted your quilt, you got the Core Banks Cross! 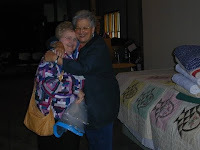 I hope to have many more pictures from Quilt Appreciation Days to share. But today the plan is to lay back, watch the Super Bowl, and enjoy the lasagna Rod has in the oven. Qad! Qad! 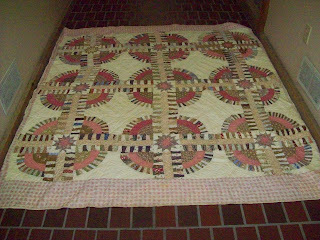 Local antique quilt alert! What does QAD stand for? Around here, that's short for Quilt Appreciation Days. Put February 5 and 6 on your calendar and come out next month to the Core Sound Waterfowl Museum on Harkers Island, North Carolina. See QAD in action for yourself. For those of you not familiar with the coastline of North Carolina, Harkers Island is tucked into a crook of the Downeast peninsula. Until electricity was strung to Harkers Island in 1939 and then a bridge built in 1941, the island was only reachable by boat. But now the once-remote island hosts thousands of visitors every year. The visitors center for the Cape Lookout Seashore stands at the eastern tip of the island and is right next door to the Museum where we'll hold Quilt Appreciation Days the first Friday and Saturday in February. We're hoping that folks from many local communities will look in their closets and drag boxes out from under the bed and unearth their old quilts and bring them in. Think of it as a giant 'show-n-tell' session. If there are stories about the quilts and their makers, so much the better! Oral historians will be on hand to record the tales. There's Lynn Gorges, textile historian and preservationist from New Bern, NC, and then there's myself (general old quilt enthusiast) who will be on hand to examine the quilts. We'll measure each quilt, check their condition, give general advice on preserving and cleaning, and even look up the pattern name if you don't know it. Here's what we WON'T do: appraise the quilt for a dollar amount. This event is not about the money! 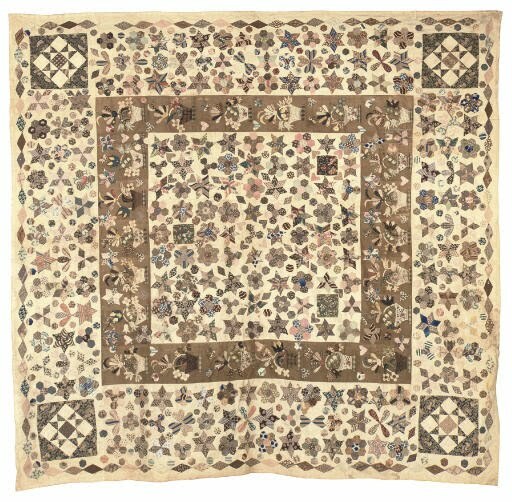 We're doing this because we love antique quilts and want to help other people--the people who own the quilts--appreciate the work and love that went into these unique textile documents and to better take care of them. 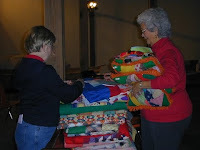 A couple of years ago we held the first-ever Quilt Appreciation Day. Even in the then-unheated wing of the Museum, we saw a steady stream of people bearing armloads of quilts over the two days. We think we saw over 120 quilts! I don't recall the exact figure--my memory's kind of blurry after the first hundred!And now we'll be in the heated large hall, toasty and warm, and even have an exhibit of antique quilts around the walls. 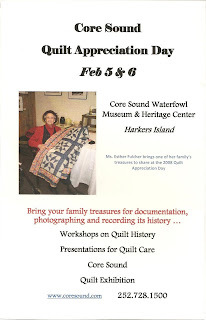 If you're interested in old quilts and would like to help at this event, we'd love to see you. Please come on Friday January 29 to the Museum--there's going to be training sessions for recorders, greeters, photographer's assistants, and quilt scribes. Nope, no pay of any kind! Well, maybe lunch! Just friendship and the opportunity to pet quilts and share our common passion for the craft. Call the Museum at 252-728-1500 for more information and ask for Pam or Joanie.